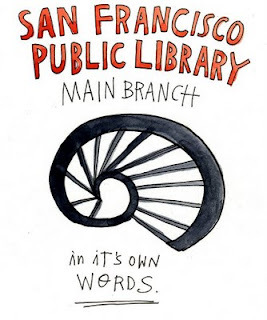 So, click the link and enjoy Wendy MacNaughton's latest work "The San Francisco Public Library Main Branch, in its own words". the San Francisco Public Library's website. "95% of the books we have are not online." What a wild reality! It is easy to think that the Internet connects us with everything... but it doesn't does it? THANK YOU for finding wonderful things like this and bringing them to us. I would never even know how to go looking for such things myself. What a treasure trove you are!